The "equity culture" of America seems to be taking a substantial hit after the twin bear markets of the past decade. [Feb 5, 2009: Mutual Funds Have Tough Decade] Aside from the obvious performance issues of the 'lost decade' I do believe quite a few other factors come into play. First, many Americans in the private sector are falling behind on an inflation adjusted wage basis - some studies now show that many Americans make less relative to inflation than they did in the 1970s. Hence less people as a proportion of society can save/invest since the middle class is being eroded and is busy 'surviving'. Without the "house ATM" which masked the loss of purchasing power, people are stuck with their wages only - I spoke about this a lot in 2007, 2008. Second, those with the most money are moving to an older age demographic and naturally will become more conservative so you have an allocation change. Third (and fourth), and these are more anecdotal from conversations and a lot of reading of comments, I believe many now see the stock market as a rigged game where those in the know or who control the mechanisms almost always win, [Nov 4, 2009: Goldman Sachs Q3 Winning Percentage: 98.4%] while the little guy is bilked [Apr 9, 2010: Muriel Siebert: American "Public Does Not have Faith in the Marketplace"] .... and frankly many people cannot take the risk anymore. Those who should be prime investors in their late 40s to early 60s have suffered two devastating losses the past 10 years and even if they have the interest, they cannot afford the risk. They will now be happy with simply seeing their hard earned money protected rather than being risked by the nonsensical stock market which was sold to them as a 'great investment' as long as you 'hold for the long run'. Considering most people will only be investing for 25-35 years of their lives, 10 years is 'long run' to them and they now view this spiel as incorrect. We spoke about the allocation switch happening a year ago so it is nothing new [Sep 16, 2009: Mutual Fund Investors Cling to Safety of Bonds, Missing Stock Rally] - what should scare the equity industry is that despite the huge rally off March 2009 lows there has been NO correlated inflows from America's burned investor base. And for those of you on grassy knolls, one must question how exactly this stock market has been rallying with so much equity being pulled out. [Jan 6, 2010: Charles Biderman of TrimTabs Claims US Government Supporting Stock Market] It should be pretty obvious since both Ben Bernanke and Mervyn King (not to mention good ole Greenspan) have stated an increase in the 'wealth effect' is essentially a goal, since it is a huge stimulus. Or if not government in some form, I guess the laws of supply and demand in Economics 101 has been broken - that is (a) lower supply of money into equity markets, with (b) fixed (or increasing) supply of stock = (c) higher prices. That was not in any of my textbooks but I guess in the Matrix, we have new paradigm math. Anything to keep the facade going. Two stories today on this change in culture in America. Please keep in mind when they throw stats at you that 40-50%+ whatever are investors in America, many of those people have $1200 in an IRA or $2100 in a 401k at work (that they will generally cash out when they leave the job). It is dogma to say "half of America is part gung ho on stocks!" [Mar 9, 2010: Nearly Half of Americans Have Less than $10K for Retirement, a Quarter Less than $1K] Hence the concentration of real investors is probably nearer to 25-30% ... which is a lot like the consumption metrics in Cramerica - completely driven by the upper quintile as the lower 75% fade away. Since Japan's 2 lost decades has brought its population who invest in their market down to 6%, there could be much more downside as more people lose faith. Retail investors in the U.S., burned by two market crashes in a decade, have shunned stocks for the longest stretch in more than 23 years, upsetting the balance of power in the $10.5 trillion mutual-fund industry. From September 1984 through March 1987, a 31-month stretch, bond funds took in more money than stock funds, ICI data show, even as the S&P 500 Index rose 75 percent. Many U.S. investors were not yet comfortable owning stocks in the mid-1980s. “In contrast to today, bonds also offered pretty good returns back then,” he said in a telephone interview. The 10-year U.S. Treasury note had an average yield of 9.3 percent in that period, according to data compiled by Bloomberg. The 10-year note yields less than 3 percent now. Renewed economic uncertainty is testing Americans’ generation-long love affair with the stock market. Investors withdrew a staggering $33.12 billion from domestic stock market mutual funds in the first seven months of this year, according to theInvestment Company Institute, the mutual fund industry trade group. Small investors are “losing their appetite for risk,” a Credit Suisse analyst, Doug Cliggott, said in a report to investors on Friday. The notion that stocks tend to be safe and profitable investments over time seems to have been dented in much the same way that a decline in home values and in job stability the last few years has altered Americans’ sense of financial security. It may take many years before it is clear whether this becomes a long-term shift in psychology. After technology and dot-com shares crashed in the early 2000s, for example, investors were quick to re-enter the stock market. Yet bigger economic calamities like the Great Depression affected people’s attitudes toward money for decades. To be sure, a lot of money is still flowing into the stock market from small investors, pension funds and other big institutional investors. But ordinary investors are reallocating their 401(k) retirement plans, according to Hewitt Associates, a consulting firm that tracks pension plans. Until two years ago, 70 percent of the money in 401(k) accounts it tracks was invested in stock funds; that proportion fell to 49 percent by the start of 2009 as people rebalanced their portfolios toward bond investments following the financial crisis in the fall of 2008. It is now back at 57 percent, but almost all of that can be attributed to the rising price of stocks in recent years. 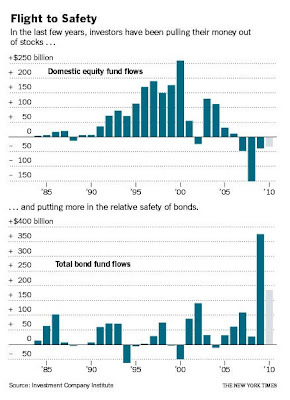 People are still staying with bonds. The flight from stocks may also be driven by households that are no longer able to tap into home equity for cash and may simply need the money to pay for ordinary expenses. Now about that new generation of 'suckers' for Wall Street to fleece? Looks like they are not very interested.